Besides Ip Man and Bruce Lee, Wong Shun Leung arguably was the third most important person that helped to promote Wing Chun worldwide by his numerous fights in Hong Kong and his teaching to Bruce Lee. Although Sigun Wong had passed away for 18 years, some of his outstanding students continue to carry the torch around the world and my Sifu Gary is one of them. I had heard that my Sifu Gary was an Assistant Coach at Wong Shun Leung’s Wing Chun School prior to becoming one of his private students. 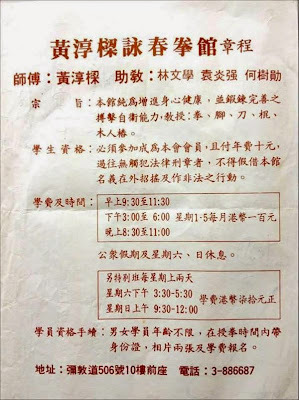 See the attached picture for an advertisement of Wong Shun Leung Ving Tusn School which lists Gary Lam as an Assistant Coach. For those who can’t read Chinese, I have translated the ad below for their benefit. Honestly, at that time, I didn’t feel anything special about it. Now, I have become an instructor myself, I realize the significance of assisting Sigun Wong to teach at his school. Being an instructor, I will only allow my most skillful and knowledgeable student teach and assign them as my assistant coach. Being selected out of Wong's many students proves Sifu Gary has to be one of a top students of Wong. (World renowned Sibak Wan Kam Leung told me that Sigung Wong asked him to assist him to teach at his school also.) Therefore, for people who are interested in Wing Chun, particularly Wong Shun Leung Wing Chun, I strongly recommend Sifu Gary Lam’s school in Los Angeles. If you don’t live in the southern California area nor can you fly there to train. Sifu Gary has certified several of my Kung Fu brothers as coaches in many part of the world. Their schools are also good choices to consider. Purpose: The School is purely for improving physical and mental health, training perfect fighting and self-defense abilities and teaching striking, kicking, knife, pole and wooden dummy. Student Qualification: One has to become a member of our organization and pay an annual fee of HK$10. No record of prior law violation. 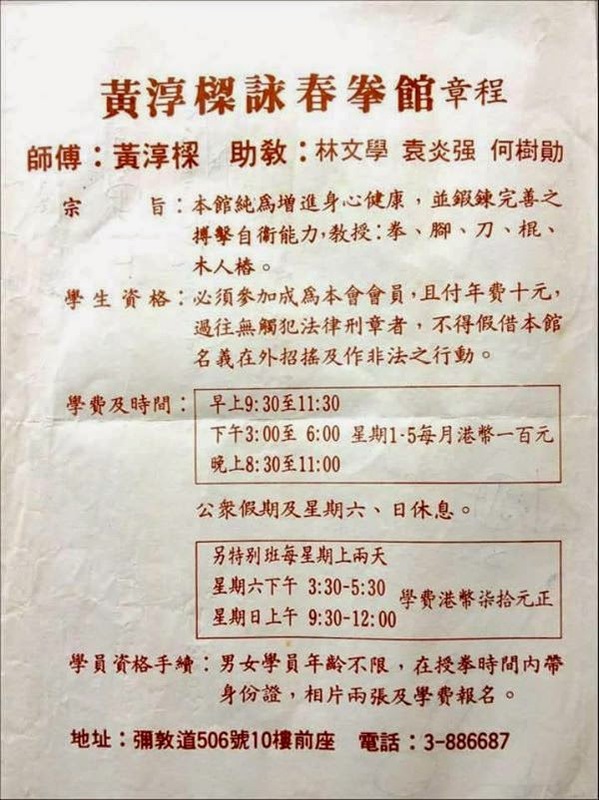 Using the name of the School to act ostentatiously or do any illegal activities is prohibited. Member Qualification Procedure: Accept both male and female and no age limitation. Bring ID, two photos and tuition to school during school hours.